D.K. Landscape & Design can meet and exceed your needs for Hardscapes. 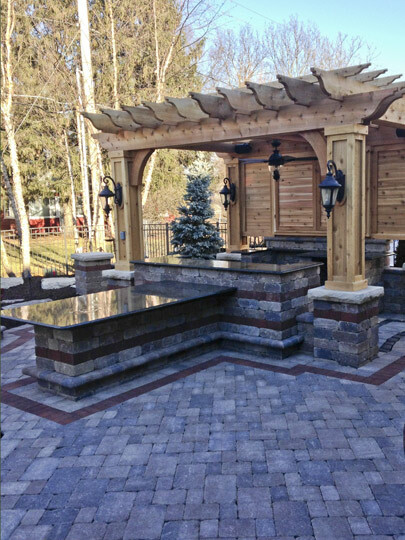 St. Charles, IL clients are happy to know that our staff can provide you with hardscape settings that enhance the beauty and practical use of your outdoor spaces, as well as matching the style and colors of your home. If you have a patio that has just been designed, our team can enhance your space’s beauty with a walkway that guides you to that patio and provides spaces to bring you enjoyment for years to come. Experts should handle your brick work– and you get exactly that and more when you trust our experts at D.K. Landscape & Design to beautify your grounds with brick work. Our staff will give you a thorough evaluation of the natural features that we can preserve and further enhance as a part of a comprehensive plan for your Hardscapes. St. Charles, IL clients are happy that our wide range of services can meet the needs of your unique situation to deliver precisely what you need. You have several options available to you when it comes to Hardscapes. St. Charles, IL clients appreciate knowing that the award-winning team at D.K. Landscape & Design can turn your outdoor spaces into stunning places of beauty. Speak with D.K. Landscape & Design at 630.551.0477 today to learn how we can provide your Hardscapes in St. Charles.